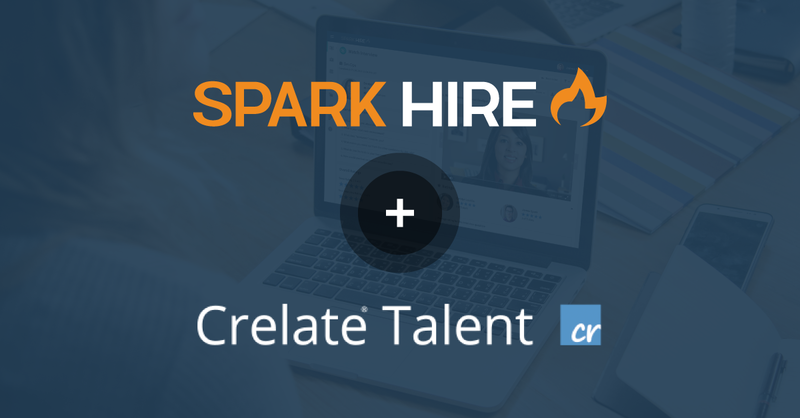 CHICAGO, August 7, 2018	(Newswire.com) - Spark Hire (https://www.sparkhire.com), the world’s leading video interview platform, has launched an integration with Crelate (https://www.crelate.com), an all-in-one recruiting customer relationship manager and applicant tracking system for staffing and recruiting agencies. Spark Hire helps hundreds of staffing and recruiting firms to place more candidates in less time. The Spark Hire video interviewing platform allows these firms to get a better look at their candidate pool than through a traditional phone screen. Additionally, these video interviews are used as candidate commercials submitted to clients for feedback and review. Both organizations value efficiency, flexibility, and collaboration, making a partnership easy. Crelate’s goal is to encourage talent management experts to grow their human relationships and foster them over time. “We are excited to partner with Crelate and look forward to advancing the staffing industry by providing our integrated solutions to hundreds of agencies,” says Tolan. To learn more about this integration, please contact Spark Hire. Spark Hire is an easy-to-use video interviewing platform with 4,000-plus customers conducting video interviews in over 100 countries. Since launching in 2012, Spark Hire has become the fastest-growing video interviewing platform. Organizations of all sizes are utilizing Spark Hire to make better hires faster than ever before. Through verified customer reviews, Spark Hire achieved Video Interviewing Leader in Summer 2018 with G2 Crowd. Pricing for unlimited video interviews starts as low as $49 per month with no contracts and no setup fees. Learn more on sparkhire.com. Crelate is a leading applicant tracking and recruitment CRM to help companies attract, engage and hire great talent. By combining the management of both candidate management and sales pipelines in a single solution, Crelate helps recruiting and sales teams stay on the same page and make more placements, more quickly. Today, more than 800 staffing, recruiting and consulting agencies worldwide rely on our fast and flexible software to grow and manage their business amidst an increasingly dynamic workforce. To learn more about Crelate's all-in-one recruiting CRM + ATS, visit www.crelate.com or call 443-569-8262.